Gloriously inspired recipes push the boundaries of live-fired cuisine in this primal yet sophisticated cookbook introducing the incendiary dishes of South America’s biggest culinary star. 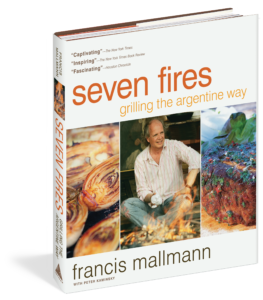 Chef Francis Mallmann—born in Patagonia and trained in France’s top restaurants—abandoned the fussy fine dining scene for the more elemental experience of cooking with fire. But his fans followed, including the world’s top food journalists and celebrities, such as Francis Ford Coppola, Madonna, and Ralph Lauren, traveling to Argentina and Uruguay to experience the dashing chef’s astonishing—and delicious—wood-fired feats. The seven fires of the title refer to a series of grilling techniques that have been singularly adapted for the home cook. So you can cook Signature Mallmann dishes—like Whole Boneless Ribeye with Chimichuri; Salt-Crusted Striped Bass; Whole Roasted Andean Pumpkin with Mint and Goat Cheese Salad; and desserts such as Dulce de Leche Pancakes—indoors or out in any season. Evocative photographs showcase both the recipes and the exquisite beauty of Mallmann’s home turf in Patagonia, Buenos Aires, and rural Uruguay. Seven Fires is a must for any griller ready to explore food’s next frontier.